Australia has long been considered the lucky country — except when it comes to our deadly creepy crawlies. Of more than 35,000 species in the world, Australia is home to 5 of the top 10 most dangerous spiders! Even the more harmless species can become a problem if you have a spider infestation in or around your house. They leave cobwebs in every corner making your home feel unclean, not to mention those moments of terror when a big, hairy Huntsman scurries out from under the bed or a pile of clothes! We exterminate many types of spiders including nomadic, ground-dwelling and orb-weaving varieties. Rid your home of Spiders for up to 12 Months! We dont just treat where you see a spider, we treat all individual problem areas around your home, this ensures the most comprehensive treatment is carried out every time. This handy guide will help you recognise the species that are likely to be found in Canberra, which species are living in your home and more importantly, whether or not they are dangerous to you, your family and your pets. A redback spider bite is poisonous and can be very painful, causing nausea, vomiting, headache and swelling. Redbacks can live 3-5 years and are quite common Australia-wide. The female redback is black, distinguished by its large bulging abdomen with a prominent red stripe down the middle. Males are similar looking, yet have a more brownish abdomen with brown and black striped legs. It grows to around 2 centimetres in body length yet the male is much smaller. Mostly nocturnal, redbacks spin an untidy web and live in warm, dark locations such as garden beds, under the house or in the garage/shed. Males will live only around 6 to 7 months and usually die after mating, whereas females will live for up to 3 years. The spiderlings hatch from spring to early summer and once hatched, they disperse through a process called ‘ballooning’; weaving small silk strands and floating away on them, like being carried away by a balloon. Get rid of spiders in Canberra now! Call 6242 7779 or request a call back! The white-tailed spider may bite when threatened, but its venom is not particularly dangerous to humans. Bites can result in pain, swelling and an itchy redness. Dark to reddish-grey, with lighter coloured legs and a whitish tip at the base of its abdomen. It is slim and grows from around 1 to 2 centimetres in body length. White tails are nomadic, living in dark crevices throughout the house. They are also often found in clothing, as they are attracted to the bright colours and floral-smelling detergents — so take care bringing in the washing! After mating, the female stores up to 90 eggs in a flat, disc-shaped silk sac and guards them until they hatch. Spiderlings will hatch throughout winter but stay in their sac until spring when they disperse. A huntsman bite is venomous and can cause local pain and swelling or in severe cases nausea, headache and heart palpitations, but otherwise it is not considered dangerous to humans. It doesn’t tend to drag its belly, so it will only pick up chemicals on its legs, often taking a couple of days to die. If you see one after an extermination, just leave it and let the treatment take its course. Light to dark brownish-grey, sometimes with darker markings or stripes on their legs. It is easily recognisable around the house due to its large furry body and long crab-like legs. The average body length of an Australian huntsman is around 2.5 centimetres, with a leg span of up to 12 centimetres. The huntsman spider is quite common in Australia and in other warm climates around the world. It doesn’t build a web but like the redback, hides in dark places and uses its swift hunting skills to dart out and catch prey. 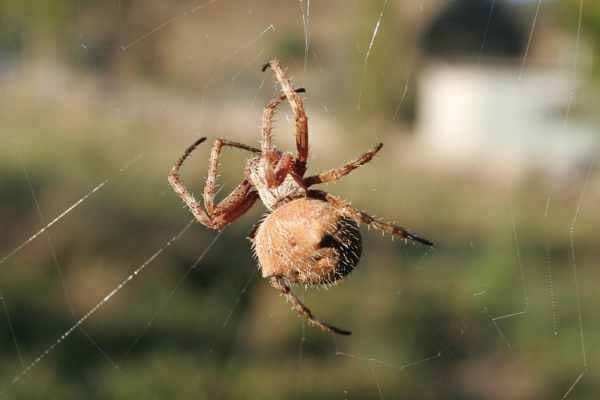 After mating, the female will create a silk sac to store its eggs and reinforce it with dead leaves or similar material, at times hiding the sac under bark or a rock, since they do not live in webs. Spiderlings will hatch and disperse after about 3 weeks. The lifespan of a huntsman is around 2 years or more. The black house spider is venomous but not considered dangerous. Although rare, a bite can be excruciatingly painful and cause nausea, sweating and swelling. Mostly matte black with dark brown to black legs and carapace and a greyish black abdomen. Around 1 to 2 centimetres in body length and up to 3 centimetres in leg length. It is found all across Australia and New Zealand and its webs are usually seen in doorways, windows and dark corners of the house. After mating, the female stores her eggs in several silk sacs attached to her web. She stays with them until they hatch and for a short period afterwards. After hatching in the spring and maturing in the summer, the black house spider will live for 1-2 years. The wolf spider has excellent eyesight and is an agile, efficient hunter. Its bite may sting and swell but it is not poisonous. Usually a greyish-brown, with dark markings on its hairy body and legs. Around 1 to 3.5 centimetres in body length. It has 8 eyes in 3 rows, long thin back legs and more robust front legs. They live in silk-lined burrows in the yard like the trapdoor and mouse spiders and different species of wolf spider are found all around Australia and the world. After mating, the male must escape quickly to avoid being eaten by the female. The female then lays around 100 eggs and carries them around in a sac until they hatch. After hatching, the spiderlings are still carried around on the mother’s back for a few weeks before dispersing. The highly venomous Sydney funnel-web can live 5-6 years and its bite can cause serious injury or death if left untreated. Glossy dark colours; brown, dark plum or black. Robust and medium to large in size. It has an average body length of 1 to 5 centimetres and an average leg length of 6 to 7 centimetres. Found in and around Sydney, including as far as the Central Coast, Illawarra and the Blue Mountains, with rare sightings in the ACT. After mating, female funnel-webs produce an egg sac containing around 100 eggs, which is stored in her burrow until it hatches. Males usually die after mating, but females can live for many years and breed several times. The highly venomous northern rivers funnel-web is also known as the northern tree funnel-web. When confronted, it will rear up on its hind legs and display their fangs. Glossy dark brown or black carapace with a matte brown or black abdomen and legs, sometimes with a plum or purplish tinge. It is the largest of the funnel-web family, with an average body length of 4 to 5 centimetres and an average leg length of 7 centimetres. Found throughout QLD, NSW and ACT. The bite of the mouse spider can at times be just as dangerous as the funnel-web. The female mouse spider is always black but the males can vary in colour, some with blue tinged abdomens and/or red heads. Usually 1 to 3 centimetres in body length with high, broad heads and their eyes spread out across the front of the head. They live in burrows like the trapdoor and can be found all around Australia. At around 4 years of age, once the male spider has reached sexual maturity, it will seek out a mate. The male mouse spider will die soon after mating, while the female will store her egg sac containing around 60 eggs in her burrow. After hatching, some mouse spiderlings disperse through a process called ‘ballooning’; weaving small silk strands and floating away on them, like being carried away by a balloon. Often confused with the Sydney funnel-web, the trapdoor’s bite is not toxic, aside from local pain and swelling. Despite the name, this species’ burrow does not have a door, but rather an open silk lined tunnel. Around 2 to 3.5 centimetres in body length and 2 to 4 centimetres in leg length. Its burrows are often found in the yard or in bushland and consist of small round holes in the ground covered by silk webbing. Males will search for a mate in humid weather and once found, will need to escape quickly afterwards to avoid being eaten. Females keep the eggs in a cocoon inside the burrow until the spiderlings hatch and disperse. A very common spider all along the east of Australia, aside from local pain and swelling their bite is not poisonous. Can range from tan to brown or black with the legs and head usually darker than the body. It has a large bulging abdomen that is often patterned like a leaf, with spots or stripes. Around 1 to 2.5 centimetres in body length and 1 to 3.5 centimetres in leg length. It weaves sticky, round webs suspended in foliage around the yard or in bushland. After mating, the female creates a cocoon stuck to foliage to house her eggs. Once hatched, the spiderlings disperse through a process called ‘ballooning’; weaving small silk strands and floating away on them, like being carried away by a balloon. Their lifespan is about 12 months. The St Andrew’s cross spider is often found stretched out in its web with its legs forming an X shape. Their large orb webs can be almost invisible and easy to walk into yet aside from local pain and swelling, their bite is not poisonous. Glossy black with yellow stripes and patterns on its legs and abdomen. The body length of the male measures around 3 to 4 millimetres while the females are larger at 10 to 16 millimetres. This species is found stretched across the east coast of Australia, from Central NSW to Southern QLD. It usually lives in warmer areas and spins its webs in trees and shrubs. After mating, the female stores anywhere between 400-1400 eggs in a thick green silk sac stuck to her web and camouflaged in the surrounding leaves. The spiderlings hatch in winter and emerge in spring. Their lifespan is about 12 months. The Golden Orb Weaver is known for its yellow silk with which it weaves its orbs. Its venom is potent but not lethal to humans and a bite may cause local pain and swelling. It ranges from reddish to greenish yellows, with black striped legs. It can grow to be quite large, ranging from 2 to 5 centimetres in body length, with long legs. Found in many warm climates around the world and widespread throughout Australia. It builds its webs in bushland, rainforest and can be found in trees and shrubs in urban areas. 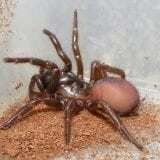 After mating, the female lays her eggs in a sac attached to its web. Once hatched, the spiderlings disperse through a process called ‘ballooning’; weaving small silk strands and floating away on them, like being carried away by a balloon. Canberra Pest Control spider treatments What's Involved? A Pre-Work Risk Assessment will be completed over the phone at the time of booking with our office staff. Details include but are not limited to: type and size of premises, specific requirements, instructions and risk information. A further Risk Assessment will be conducted by your technician on site at the time of the treatment. Details will include risks encountered at the time of treatment as well as specific information regarding what was done to negate any risks identified. As standard we treat the inside of your home, although many customers choose not to do this. Please speak to a member of our team for more information. Our treatment includes your roof voids & subfloors, if you have them. Your Technician will then complete a full exterior barrier spray to the outside of your home. Essentially we treat every straight edge or angle where you might get a spider on the outside of your home. This not only exterminates spiders you can see, but puts down an effective barrier at the same time. We don’t just spot spray spiders where you see them, like many other companies do. As standard we also treat the all extra pest harborage areas around your home including your garage inside and out or carport, garden sheds, clothesline, pergola's and decks, fence railings, outdoor furniture, kids play equipment, we even spray your mailbox & garbage bins. We provide a 6 month warranty on our Spider Comprehensive Treatment – as a rule however, you should get up to 12 months out of our treatment. We will remind you in advance every year to let you know that your treatment is due. By treating your home every year, you will find that the treatment wont give pests a chance to breed up and you will just get used to living without them! Prior to the agreed appointment time we ask you to complete the following steps to ensure a smooth, efficient treatment. Close all windows and external doors. Open curtains & blinds. Put away or cover any exposed food like fruit bowls as well as toothbrushes. Don’t leave clothes on the clothes line (we spray the line for spiders). If you have small children, put away toys or things likely to go in mouths. If you have pets; dogs, cats, birds etc, we suggest they be out of house for the same period as yourself. Ideally take them with you, particularly dogs if they are nervous or savage. Remove or up turn their food & water dishes. For indoor fish, cover the tank with glad wrap & switch off the filter. We do not spray aviaries, chook pens or near fish ponds. Unlock anything we will need access to, such as subfloor door, garden sheds, garage, side gates, etc. We specifically ask you to have your car out of the garage or driveway before we arrive & leave it in the street to allow full access and to avoid delaying the technician. We run to a very tight schedule so we will be there on time (allow 5 minutes for traffic), Please ensure you are 100% ready to go by the appointment time. We ask you to be out of the house for at least 1 hour after inside treatment is completed. We will advise you if any longer is required. If you regularly clean your windows, don’t clean them for 2 weeks after the treatment, because the treatment will keep working. Ideally leave any cobwebs for two weeks and then brush them away. When you return, open all the windows to let fresh air in. They come in many forms including: orb-shaped, funnel-shaped, or even an untidy mass of silk in a dark corner. Moist environments can attract certain spiders, especially if they are dark, since most spiders are nocturnal. If you have a damp basement, attic or shed, you should check it regularly for webs and crevices where they might be hiding. Many spiders do not live in webs, instead they build burrows in the ground lined with silk — you may notice that some have a small dirt or silk trapdoor beside the entrance. Spiders lay their eggs in silk sacs affixed to their web or burrow, or carried around by the female. If you see one of these sacs, it is a sign that there will soon be more spiders around. Some spiders are nomadic and reside neither in webs or burrows, instead choosing to take refuge in dark crevices in your home. If you have seen a huntsman or white-tailed spider for instance, they may be hiding under your floorboards or in your walls. Spiders generally prey on other insects, so if there is an abundance of insects like ants, flies, woodlice or moths in and around your home, it is likely that spiders will be drawn to the area. In general, the spiders you are seeing are only a small portion of the rest that are hiding in your home. If you are seeing the same species of spider as regularly as once a week, then you have an infestation. Use a sealant like caulk to seal up cracks and crevices around windows, skirting boards, floor boards and loose electrical outlets. Eliminate other entry points by replacing torn window and door screens. By simply cleaning the surfaces in your house regularly and removing any cobwebs, you can discourage further infestation. In addition, by de-cluttering your home and shed you are removing any shelter or hiding places for spiders. Spiders are not attracted to light, but their prey is. Leaving your outside light on at night will attract insects like moths and flies, which in turn will lure spiders to the area. Spiders’ natural habitat is amongst vegetation, therefore many will make their home in your garden and if there are trees, shrubs flowerbeds, or piles of grass clippings or leaves surrounding your house, they will have easy access to the inside through any available cracks or crevices. Pets, cats especially, will enjoy chasing and hunting down spiders. They will also do a good job of scaring the spiders off fast, but a word of warning, be very careful of which type of spider you are dealing with. This will depend on which pest is being treated. We focus our treatments on the places that pests live and breed even where you can’t see them. Depending on the type of pest, these areas can include roof voids, sub floors, full external treatments in & around the home, garages, sheds, pergolas, any structural areas, inside your home (skirtings, cornices, window & door frames). These internal treatments are kept well away from contact with you. We recommend that you have our Spider Comprehensive treatment (which includes cockroaches, silverfish, clothes moths, earwigs and slaters) every 6 to 12 months. This will ensure longevity & not give pests a chance to breed up. If you notice a pest infestation at your home, contact us ASAP before it becomes a larger problem. Refer to our spider identification guide to find out which species of spider you have a problem with. Some of the most commonly found species in Canberra include the Redback, White-Tailed, Huntsman, Black House & Wolf Spiders. How can I tell if I have a spider infestation? In general, the spiders you are seeing are only a small portion of the rest that are hiding in your home. If you are seeing the same species of spider as regularly as once a week, then you have an infestation. Check 'Signs of a spider infestation' in the advice section above for more telltale signs. Can spiders burrow into walls? No, spiders can't burrow into walls. They can, however, go into cracks or holes that are already in the wall. In addition to pest control, what else can I do to deter spiders around the home? There are a few things you can do yourself to discourage a spider infestation around your home. These include simple habits like turning off outside lights, cleaning and moving plants away from the outside walls. For more information on what you can do, read the handy tips and tricks in the advice section above. Is pest control safe for children and pregnant women? The simple answer is Yes. When we use pesticides or baits, we select formulations with the lowest toxicity available & apply these products where pests breed and live, not where you can come into contact with them. Is pest control safe for my pets? Yes, however we have some basic precautions you must take, including having them away at the treatment time and ensuring all food and water bowls are upturned or removed from treatment areas prior to treatment. What happens if I have asthma or allergies? Often you may simply need to stay out of the house for a little longer than usually needed. There are however, many different products and techniques we can use to control pests. If you or any member of your family suffers from asthma or is sensitive to chemicals, please let us know, or seek medical advice. How long does spider pest control take? Once all the necessary preparations have been made, the time the treatment takes will depend on factors such as the size of your home and difficulty as well the severity of an infestation. Simply ask one of our friendly staff at the time of booking and they will give you a close estimation. When treating for spiders, we also exterminate cockroaches, silverfish, earwigs, slaters, millipedes, clothes moths, pantry moths, paper wasps & mud wasps at no extra cost.